The Gemstone Biomat – GemPowerment. Reveal your light. GemPowerment is a trusted provider of The Biomat, a phenomenal infrared light therapy experience for healing. Read on to learn more about how light therapy can help improve your life today! Is the Biomat Necessary for Every Home? The BioMat is designed to emit light at wavelengths that have healing properties. Amethyst was chosen because of its unique light signature and conductive properties. When heated, it emits light at 8 and 12 microns of wavelength. This light, on the far infrared side of the spectrum, penetrates deeply into tissues, increases circulation and metabolism, and relieves pain directly. Cells are able to absorb more oxygen, export more acidic wastes, and repair themselves faster when metabolism is higher. The healing tools have been found to benefit chronic pain conditions, as well as autoimmune conditions, including fibromyalgia, back pain, neuropathy, Lyme disease, and even arthritis. Click here to email us and order your own Biomat today! Click here to order your own Biomat today! Amethyst also known as the Healing Stone, bolsters the production of the hormones, and strengthens the cleansing organs, the circulatory system and blood.This brings the immune system and body metabolism into balance and harmony. Amethyst also soothes the nervous system and aids in the transmission of neural signals. And memory skills improve with the use of this stone. The body experiences far infrared rays differently from other types of heat. The warmth is very soothing and gentle, but it can also build up quite powerfully over time, depending on the temperature setting. And even though the Bio-Mat itself may become warm during use, it will never get hot to the touch. This is a big sign of quality in an infrared heating pad. Only the finest quality materials are used in the construction of the Biomat and is designed to last for years. The Biomat is controlled by an advanced computer technology that monitors and controls all aspects of its performance. If any part of the mat gets higher than the selected temperature, the current is cut off by thermal sensors distributed throughout the mat. Only the highest quality amethyst is used in the construction. In fact, a gemstone certificate is included with your Biomat. The Biomat uses the highest quality bi-metal in its mats. Bi-metal is used inside infrared mats as a heat sensor to control heating functions within the mat. Low-quality bi-metal can break over time with usage, rendering the mat ineffective. There is only one type of ‘high quality’, long-durable bi-metal sold on the market today. This bi-metal is manufactured by Texas Instruments and was originally developed for military usage. Ours is the only company that has access to and uses this high quality bi-metal in their mats. This means a guaranteed longer life for the mat, reflected in Richway’s warranty and repair policies. Although the expensive bi-metal is higher in cost, it is the only bi-metal meeting Richway’s exacting standards, and is one more reason the Bio-Mat is the superior mat of its kind. The Biomat delivers the benefits of a far-infrared sauna for a fraction of the price. 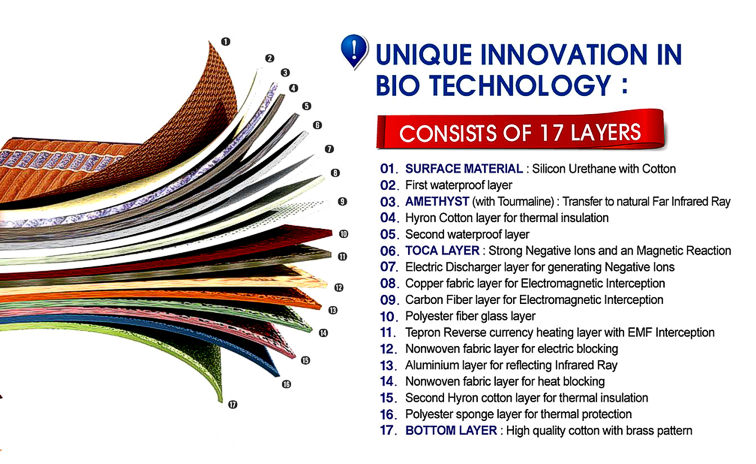 Unlike conventional heating pads, the Bio Mat protects your body from harmful household alternating current by providing power using a five-tiered buffering system in which the AC current is converted to DC (direct current). Unlike a heating pad, the Bio Mat heats your body and not the pad. It radiates and penetrates deep into the body. Do you know anything else that gives you so much in such little time? The Biomat is designed so that you can sleep on them and get true therapeutic sleep, with a range of temperature settings from 95 degrees to 158 degrees of therapeutic infrared heat. It is important to understand that this FDA approved medical device is not a scam and is a must for every home.